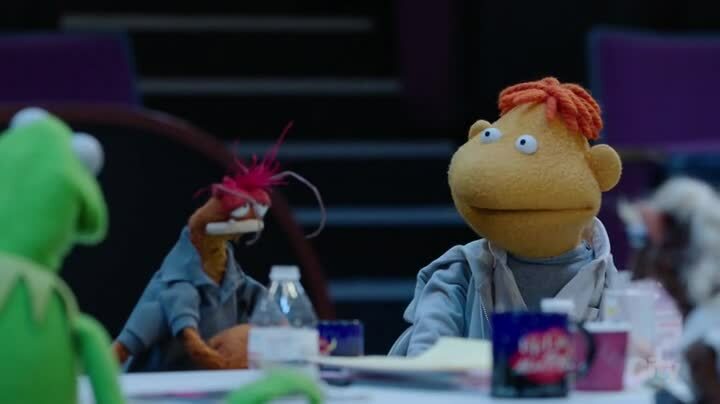 One of my criticisms of The Muppets in the previous episodes was they made Miss Piggy incredibly unlikable. To the point where it became a mystery why anyone has anything to do with her. 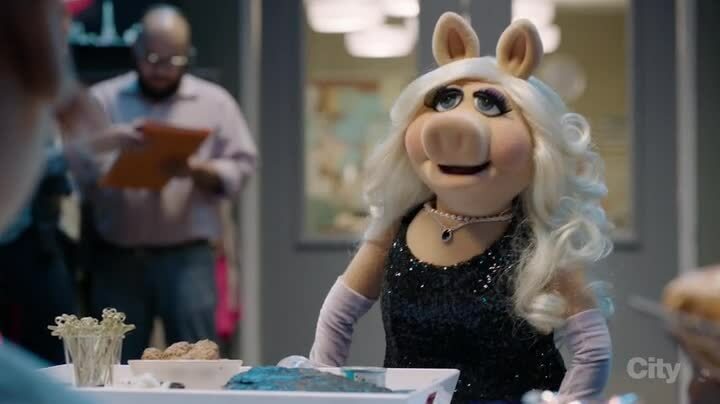 “Pig Out” solves this problem by providing us with a Piggy who people want to be around and enjoys the company of her fellow Muppets – largely because they enjoy her access to famous people and famous people parties. While that might not seem like something good, it actually turns out great with Piggy genuinely enjoying her success with her crew, and the crew enjoying being around her. A welcome change from Piggy getting into random feuds with celebrities over tiny things or fighting with Kermit while obviously being wrong. 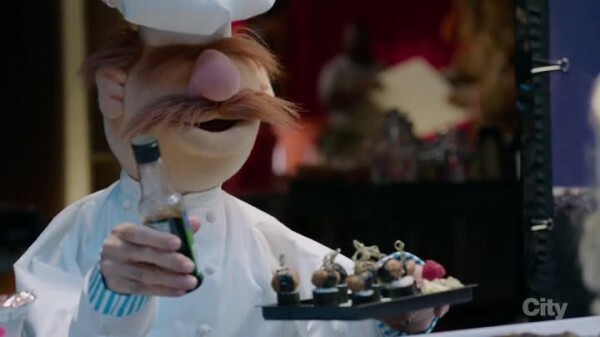 The episode is filled with a lot of little touches that add to the fun, with a special focus on the Swedish Chef, who acts as the caterer for Miss Piggy’s Show. During one of the interview scenes, we see him in the background licking the various pastries and then putting them back on the pile to eat. He later presents Swedish sushi to Piggy, and it looks as gross as it sounds (she passes). 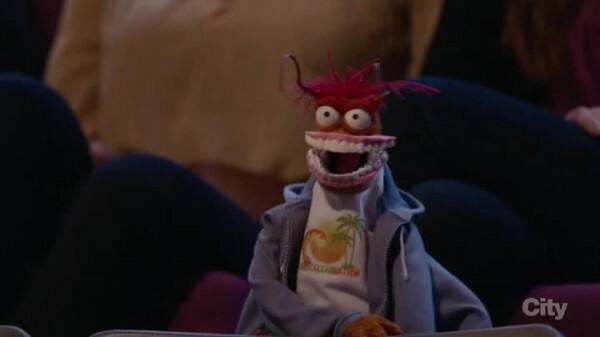 During the karaoke montage while the gang is partying, Swedish Chef breaks out “Rapper’s Delight”, which was awesome. 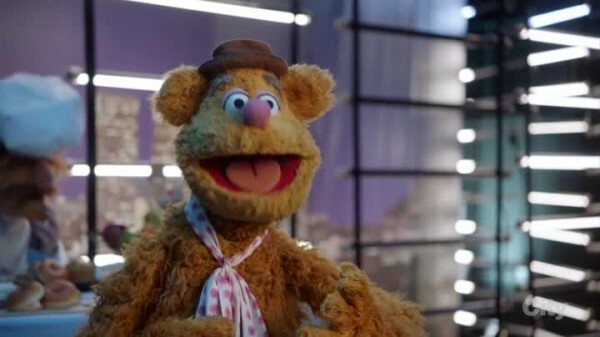 The show opens with Fozzie warming up the studio audience while being jeered by Statler and Waldorf. One t-shirt cannon accident later, and Statler gets blasted out of his seat by a t-shirt. 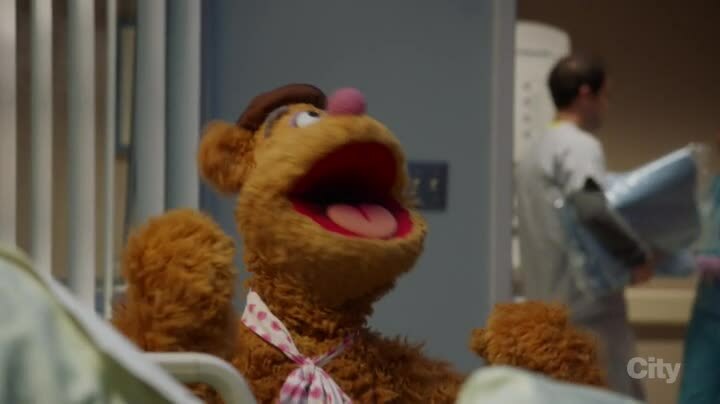 He ends up in the hospital, and Fozzie is consumed with guilt. 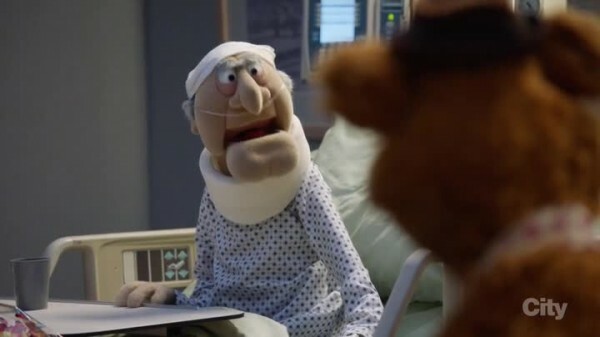 Fozzie goes to apologize at the hospital, and Statler guilts him into running all over town collecting a bunch of things to help him feel better. 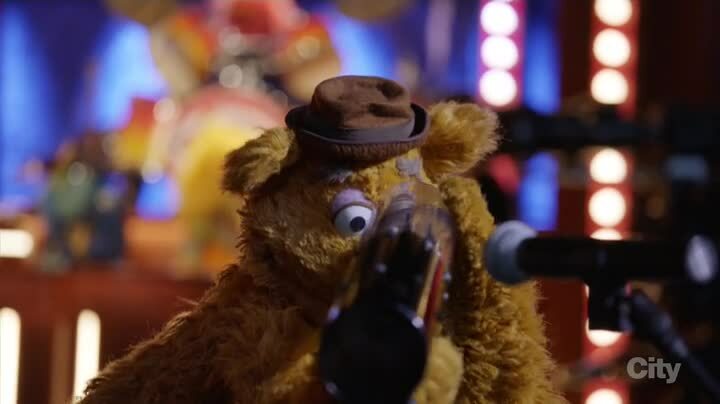 And if you know anything about Statler and Waldorf operate, you know it is all a big joke of Fozzie. The main story has Piggy overhears the crew talking about having drinks after work, and realizes they meet up without her. Kermit tells her that the crew meets to unwind and complain about her and him, but Piggy demands to be invited, even though she’d never actually go out with them. She’s upset that they didn’t want her there, and promises to say “no”. So of course when Kermit convinces Pepe to ask her, she changes her mind and agrees to come. It starts out as bad as you expect, with Piggy regaling them with complaints about her limo driver and landscapers. 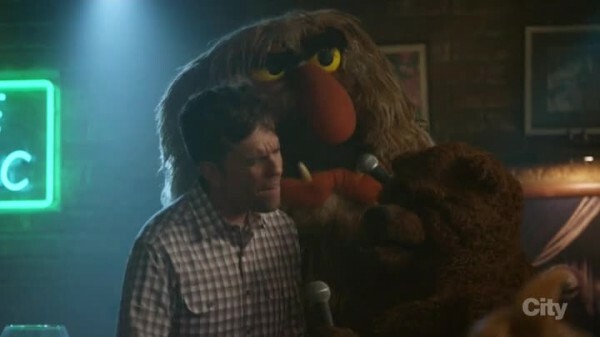 But then Ed Helms shows up, and soon a karaoke party breaks out and things get wild. The karaoke montage is a great bit of the various Muppets singing different songs (and some of the Muppets get drunker and drunker as the night goes on). The problem with the crew is out partying all night is that no one will be capable of creating new episodes of the show in the morning. Piggy even tells them all to come in late. Kermit naturally freaks out, and the crew follows Piggy’s lead in mocking him. And just as Piggy manipulated him into manipulating the crew into inviting her, he now has to manipulate her into not going out with them, convincing her that the crew should see her as a goal to aspire to that they can only view from afar. 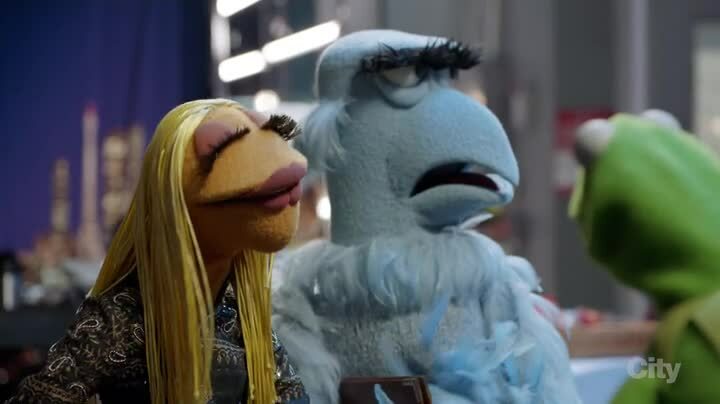 The episodes only down point is Sam the Eagle becomes the sadsack Muppet of the week, revealing a crush towards Janice from The Electric Mayhem. He spends most of the party being increasingly frustrated that she’s talking to everyone but him, and his karaoke performance of “Wind Beneath My Wings” bores the room and leaves everyone checking their phone. Other nice touches include the Piggy quote “Do these diamonds make me look relatable?” There is also Beaker’s Piggy impression, and Bunsen and Beaker showing up the next morning wearing each others’ clothes (it happened outside of work, so they don’t own Kermit an explanation!) 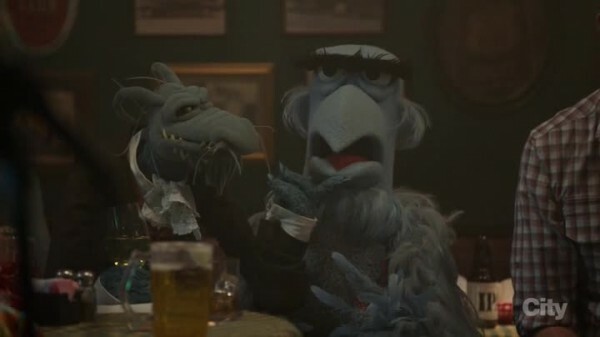 Uncle Deadly continues to have great lines, offering to cover up Statler’s accident. When the show just has things happen, it became great and had plenty of jokes and story to flesh it out. The only misstep was trying to force another one-sided romance subplot on a show that has too many too soon already.